With warm weather just around the corner (hopefully sooner for some of you than what I’m expecting here!) I figured it was time to start pulling out patterns for some warm weather clothing. 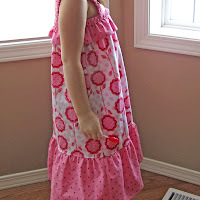 This One Hour Sundress by Christine at From an Igloo is a great way to start the season!